When Trevor joined Boy Scouts, he entered a different troop than all of his Cub Scout friends. It was a hard decision for him, but we told him we'd help him stay in touch with his friends. So when Trevor wanted to complete his first merit badge, we invited Landon to join him. The boys did the Aviation Merit Badge at Hiller Aviation Museum. It was outstanding. The session was 6.5 hours. Steve and I dropped them off, but returned a few minutes early so we could get photos of them using the flight simulators. 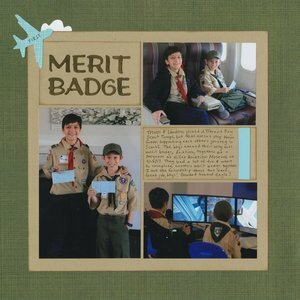 To make the layout, I used one of those photos, along with pictures of Trevor and Landon sitting in an airplane cabin and posing with their first blue cards. I happened to have a blue airplane die cut (serendipity!) that was perfect for completing my title. Very cool! I love seeing all the things Trevor is doing and how you scrap them. I always love your clean and simple layouts. How awesome. These activities must be pretty interesting to keep the boys occupied for so long. P/s: Don't you love it when you just happen to have the perfect embellishment for your layout? I love this! LOVING those photos and loving the airplane!!!!!! !